Ready for a cocktail? 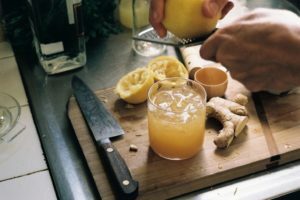 Our versatile version of the Penicillin is refreshing in the summer and warming in the winter, thanks to Manuka honey-infused ginger, turmeric, and lemon. You could almost say it's medicinal.... Bottom's up! Juice ginger and mix into honey. Garnish with fresh julienned ginger.